The 2017-18 flu season was one of the worst in decades, hospitalizing hundreds of thousands and claiming more than 40,000 lives in the U.S. These numbers serve as a sobering reminder of the dangers of influenza, said OMRF immunologist Eliza Chakravarty, M.D. And with a new flu season on the horizon, Chakravarty urges Oklahomans to protect themselves by getting vaccinated. Last year’s flu shot performed poorly, ranging between 10 and 30 percent effectiveness. But that doesn’t mean you should avoid taking the shot this year. Even if getting the flu shot sounds unappealing, Chakravarty emphasized that it’s in your best interest—and the best interest of those around you. For those who are averse to needles, the nasal spray is available again this year as an alternative for people without conditions that suppress the immune system. Over the long term, getting the flu vaccine annually will boost your body’s ability to protect itself if past strains resurface, as happened several years ago with swine flu. 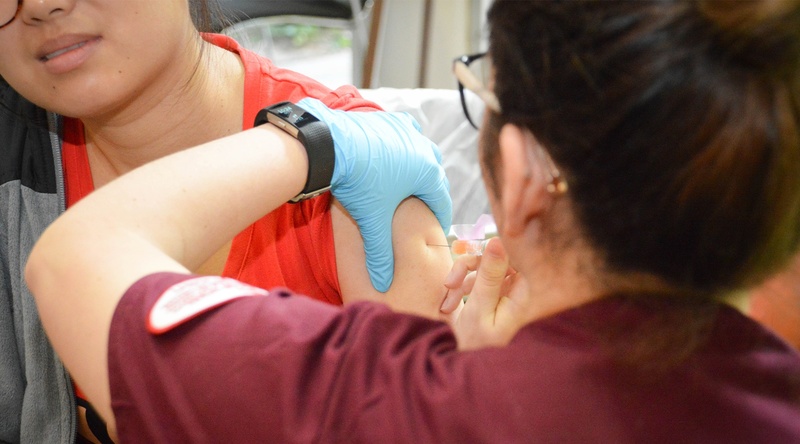 “And if you’re unlucky enough to get the flu after having the shot, getting vaccinated often means get a less severe version,” Chakravarty said. Many still fear that getting a flu shot can cause the flu. Don’t worry, Chakravarty said, it’s not possible. Although peak flu season runs from December until February, Chakravarty said it’s possible to get the flu as early as September. So, the earlier you get the shot, the better. “If you can physically get the flu shot, do it. It saves lives,” said Chakravarty.